Both our Cockatoo Marshmellow and our Severe Macaw Buddy love playing and biting the Jurassic Dinos and Large Spinning Moleules this wonderfully chewable bird toy. Even though this toy is made for the "Big Guys" our Severe Macaw Buddy (who thinks he is a "Big Guy") loves playing with it. Toy measures 12" long and 12" wide. Parrot toy contains Jurassic Dinos and Large Spinning Molecules over 4 feet of 1/2" Supreme Cotton Rope. All mounted on an 8 inch plastic Funny Bunny. FunTime Bunny Macaw/Cockatoo Parrot Toy5SusanJune 11, 2015This is one of the few toys unlike other sites I've purchased Luna she hasn't chewed up quickly. She played with it for weeks instead of days! The letters provide more chewing sensation than wood. It seemed to satisfy her. Your business is great too. I love the personal touch I received and the free samples with purchases are awesome too. It's like receiving a Christmas gift when they come in with a personalized label on them addressed to my feather babies names etc. I love the discount I reiceive for being a repeat customer over the years too. Great job!!! I recommend you to anyone and this toy too. Luna is a blue and gold macaw. I forgot to mention that. 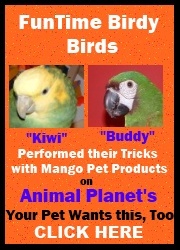 Our parakeets love things I've purchased for them from you too! FunTime Bunny Macaw/Cockatoo Parrot Toy5Ron SelfApril 15, 2012This toy is great. Both my Macaw and Cockatoo love it. The material it is made of does not fall apart like wood toys so it last longer and gives my birds days and days of fun and exercise. FunTime Bunny Macaw/Cockatoo Parrot Toy5M.L DerousseJanuary 26, 2011Lulu,our sweet blue and gold recently lost her mate of over thirty years. The new toys from Fun Time Birdy helped her through her grief. She hasn't played or chewed this one yet. She likes to go up to it and "nudge" the bunnies and admire the colors.